Here's an inspiring story to complete your day. A "habal-habal" driver was able to buy a new motorcyle after saving coins for 8 months. Jeffrey Catayas, a resident of Barangay Tisa, Cebu City, drives a "habal-habal," a motorcycle with modified seat to allow more passengers. This type of vehicle for hire is common in the provinces particularly in areas where jeepneys and tricycles cannot enter narrow or rough roads. According to Super Balita Cebu, Catayas started saving P5 and P10 coins in his lantay, a bed made of bamboo slats, last January. 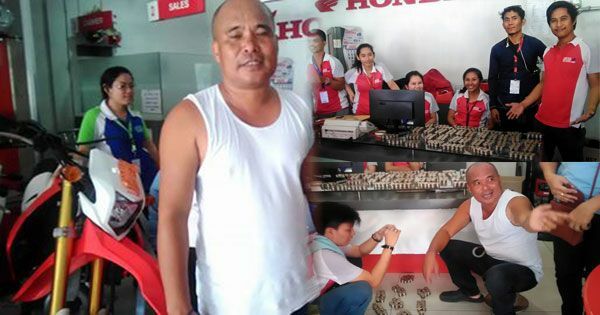 Eight months later, he brought his savings at a Honda Center in Cebu, counted it there with the help of store employees, and then bought a brand new motorcycle in cash. Catayas earned praises from Filipino netizens on social media for his perseverance and determination.